What can I do with 5 children who have been super great in the hospital for 5 hours??!! We go home! That’s the first comfy place. It’s been 5 hours to infuse a new alternative program for our foster son’s cancer that won’t go away. He now has moved in with his bio-Dad and it is our day to hang out. The hospital is not exactly the ideal location but this is why we do it! But during our time in the clinic we read a wonderful book, watch a movie, rest and now I want to give a healthy treat for my beautiful munchkins! Here’s why we are here. I use what I have in the kitchen and thankfully, it is spectacularly good! 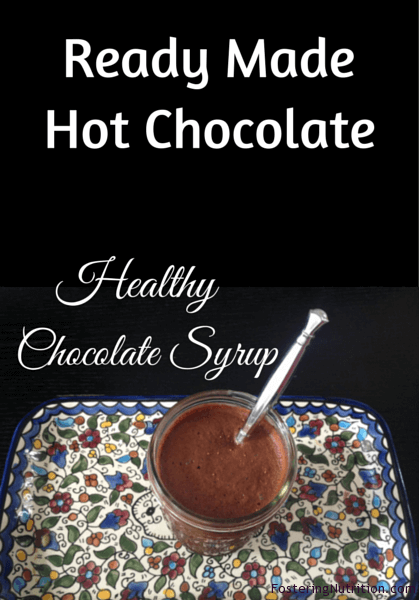 It is now a weekly treat, so when I make a batch of chocolate syrup, I usually triple the recipe for a Ready Made Hot Chocolate. We store the chocolate syrup in a mason jar in the refrigerator. Start boiling the 3/4 cup of water per person while you make the following syrup and pour into each mug. This makes the syrup that will be poured into each mug. Stir these ingredient into a very large mug with just a bit of hot water. Note: the coconut milk and oil will help emulsify the cacao powder so it won’t be so hard to stir. It drives the children crazy when we forget to add milk and oil because they stir and stir and stir…and the cacao is STILL not blended! Ha! We like very dark chocolate (75%-80%), so based on your mug size, you determine how “dark” you like your hot chocolate. In each person’s mug we generally put about 2 Tbsp of syrup and add the 6-8oz of water. If it’s too dark just add a little more hot water and milk in equal amounts or add more ready made hot chocolate syrup to strengthen the hot chocolate. Below is a photo of the syrup in the mug before we add the warm water. Add relatively hot water to each mug and stir. And you can also use this to put on your ice-cream, strawberries and more. 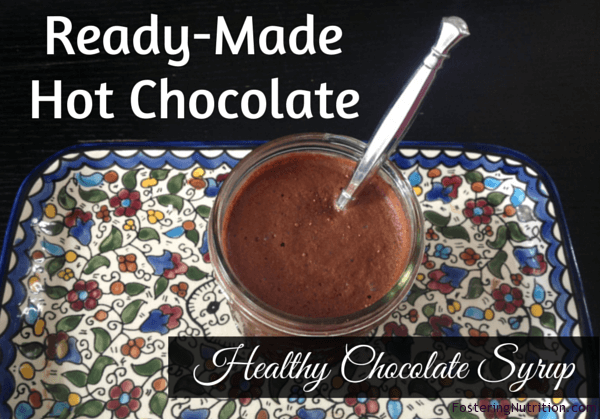 Super yummy, comfy food Hot Chocolate, and it makes you feel good about what you give your children. Now you can have Ready Made Hot Chocolate for those special moments. Have fun Fostering Nutrition…because everyone deserves to Be Healthy and Belong. Holy crap, thank you so much for posting this! It is gonna be so helpful when I research Coconut Milk at the market! Crazy!